A spear is a pole weapon consisting of a shaft, usually of wood, with a pointed head. The head may be simply the sharpened end of the shaft itself, as is the case with fire hardened spears, or it may be made of a more durable material fastened to the shaft, such as flint,obsidian, iron, steel or bronze. The most common design for hunting or combat spears since ancient times has incorporated a metal spearhead shaped like a triangle, lozenge, or leaf. The heads of fishing spears usually feature barbs or serrated edges. 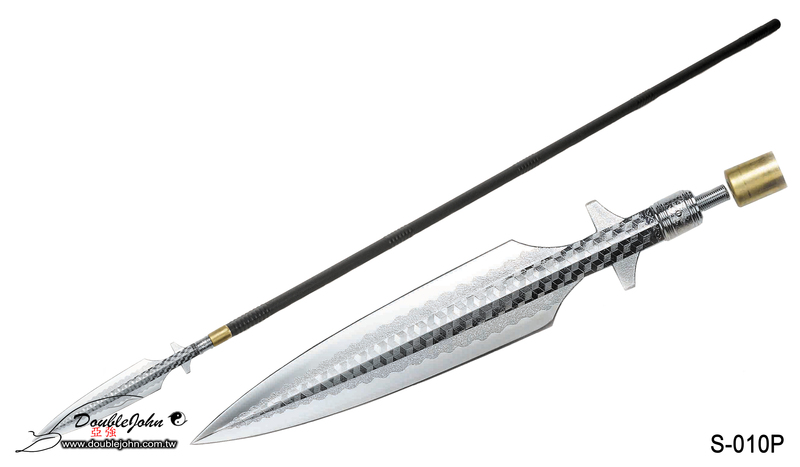 (TS-306-L) Long Stick L - 183cm; 72"
(S-010P) Spearhead - 43Cm; 16.9"